Mary V. Dearborn’s biography of Ernest Hemingway takes him apart in minute pieces. To say that he was a complex character is an understatement. Dearborn focuses a great deal of attention on his relationships, all of which were problematic. One of the more interesting aspects of the book is the backstory she provides about the most important people in his life: his mother, his wives, and his fellow writers—an endless list of names both famous and not so famous. Her focus on his writing is achieved through how these people helped or, in his mind, hindered his success. In his early work, The Sun Also Rises, the first twenty pages were edited by F. Scott Fitzgerald who recommended “cutting at least 2,500 words out of the first 7,500 . . .” resulting in a much-improved work. As his fame grew, however, his publishers came to realize that the only editing he would allow of his work was that related to fixing his grammar and punctuation. Editors were not allowed to edit. Throughout his life, Hemingway saw himself in the hero’s role, creating stories and/or situations to fit the image he had of himself. He seemed to have no fear when placed in perilous positions, even when serious injuries resulted. 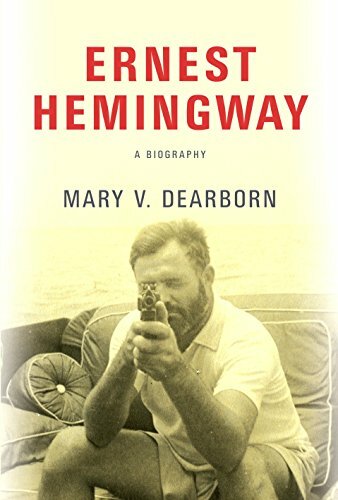 Dearborn devotes some interesting discussion to Hemingway’s role in espionage during World War II, although certain of his experiences such as U-boat hunting were expensive and demanding, with worthless results. With the onset of The Great War, Hemingway itched for action. Unable to enlist in a fighting unit, he became aware of the need for Red Cross Ambulance drivers. At one point in Milan, he was close enough to the action to have been wounded when a trench mortar bomb landed near him. Many versions of the incident would surface as the years passed, changing as Hemingway related them himself. One thing was true; he suffered wounds from shrapnel, and a concussion. The latter would play a larger role in his life. His participation in the Spanish Civil War and World War II led to additional stories that would change with each telling, always with his exploits strengthening through each story. Dearborn’s commentary on Hemingway’s life as a journalist at The Kansas City Star newspaper, and as an expat in Paris in the 1920s digs deep into his beginnings as a writer and shows the trajectory his writing life would follow. Europe played a major role in his life, and the most positive place for him was Spain. Hemingway loved the outdoor life; he was a sportsman’s sportsman, especially enjoying hunting and fishing. Hemingway was happiest when “surrounded by a group of male friends.” He did not favor team sports, but could become fanatic about being the best at individual sports such as hunting, boxing, and fishing. In his mind he even took this approach toward war as a single-man sport. The characters in his writings sprang from true life—his friends, his family, his wives—and they were not always painted in complimentary tones. During World War I, while recuperating in the hospital in Milan, he met and fell in love with his nurse, Agnes von Kurowsky, who was seven years his senior. She rejected his advances, and according to Hemingway scholar, James Nagel, the rejection “had hurt him severely, so deeply that he wrote about it all his life.” Von Kurowsky became the model for the heroine in A Farewell to Arms. One of the most enlightening parts of this biography is how Hemingway treated the women in his life. Although his marriages started out on firm ground, it did not take long for Hemingway’s roving eye to find a new love, always while he was married to the current wife. To be fair, it seems that each new woman who entered his life, did so with one thing in mind: to become the next Mrs. Hemingway. Soon his eye wandered to Pauline Pfieffer, wife number two, probably the woman who loved him the most. They had two sons, Patrick and Greg. Both Richardson and Pfieffer brought their own financial stability to the marriages, much to Ernest’s delight, as their financial situations allowed Ernest to live the life of a writer without further encumbrances. Martha Gellhorn, wife number, like Pfieffer, entered the scene while Ernest was still married, and yet he gave little care to his wife when he became entranced with Martha. But Gellhorn was more of a challenge, as she was a well-respected journalist and author in her own right, and her career goals often surpassed his. Mary Welsh, wife number four, did not come into the marriage with the finances or the experience the others brought. But until his death, she remained by his side. Throughout his life, Hemingway experienced several sexual fantasies and fetishes. Dearborn frequently refers to Hemingway’s hair fetish. He was attracted to women’s hair, especially the color and style, and often included references to hair in his stories. He enjoyed role-playing with the women in his life, and often took the female role, while assigning the male role to the woman. And yet he had a deep fear of being considered homosexual. Dearborn does not dwell on the specifics of Hemingway’s death, but she discusses the various aspects of mental illness as it affected him, especially as it took on momentum as he aged. The most engaging thing about Dearborn’s book is the style she employs, that is, one feels a part of the story, as if riding on Hemingway’s shoulder, experiencing what he experiences, and in effect, almost becoming Hemingway. She engages the reader with both the well-known stories and references to his writings, as well as many little known facts. This is a worthy biography.